I'm traveling and away from all of my craft projects for the next few weeks, but I brought my crochet needle with me. I just started a scarf last night and plan to (if I have enough yarn) make a hat too. It's super simple to crochet simple projects like a hat or a scarf. There are many YouTube videos online that you can watch to get simple instructions too. Here is a quick link to learn to crochet. These also make quick and easy gifts. Start today and have a pile of scarves and hats ready for next Christmas! The other day we ate a frozen pizza. Doesn't really work with the "trying to eat healthier" diet, but hey...it was onhand, quick and easy. I cut a piece of the cardstock that came with my CVS photos as the top of the ornament and covered with scrapbook paper. Then i traced and glued on my cardstock. I applied a thick layer of mod podge and now they are good to go. Easy, quick and best of all FREE! During the hustle and bustle of daily life, especially during holidays, we tend to get overworked, overshopped (is that really possible??) overstressed, and overirritable. So....on your to do list....pencil YOURSELF in to Take A Break. God tells us from the very beginning of creating the world and everything in it that He rested on the 7th day. Take His advice.....pencil in your time to Take A Break. All Sorts is offering a free craft to make today. Head on over to her website and download your free template for this cute little Christmas Starry Angel. 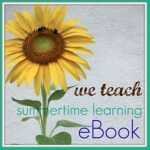 It's a great fun and FREE project to do with the kiddo's. Who doesn't love to peruse the card aisle and open a few cards to get your chuckle on. 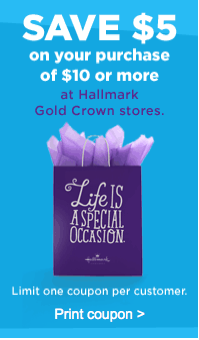 Well now you can save $5 on a $10 purchase at Hallmark when you print THIS coupon. I'm super stoked to head over and find a great deal! Download your FREE copy of "12 Overnight Breakfast Casseroles for Christmas Morning" eCookbook with 20 pages of recipes. Since incorporating exercise into our daily activities during school (from 10:30-11-ish) it has been difficult to find something that we all enjoy doing. Since it's that time of year for baking YUMMY goodies to eat and to share, check out Little House on the Praire Living for some coupons to print and SAVE you more money this Christmas season! Some of the coupons are Argo, Nestle, C&H, Arm & Hammer. 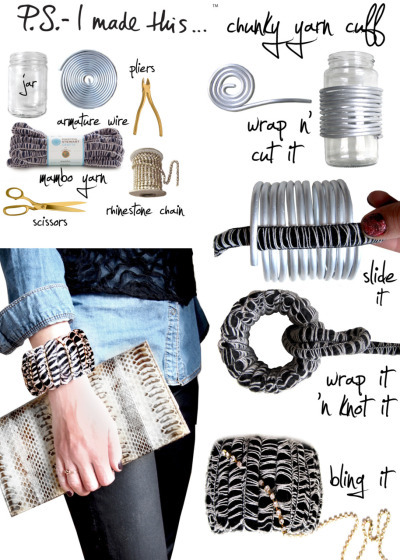 I watched P.S.-I Made This create this fun yarn Mambo bangle on Martha Stewart. You can make your own by checking her video out on Martha -OR- by going to her site. I was perusing blogland....imagine that....me...reading blogs...and I HAD to check out Martha while I was at it...and she had THIS fabulous recipe. I had THE GIRL help spoon the jelly for the filling in with a baby spoon. Then we frosted the top with peanut butter icing (I'm still learning how to frost....don't judge my cupcakes by their frosting) and again topped with jelly. They taste EXACTLY like a PB&J sandwich, but sweeter. This year sure has been brutal on my skin. I am itchy and dry feeling all of the time. Here are a few tips to help you prevent and HELP the horrible itching and dryness of your skin this winter. 1. When showering, don't use super hot water. The heat will contribute to your dry skin. 2. Once you get out of the shower, PAT yourself dry or drip dry. Your skin will retain the moisture. 3. Use a skin friendly lotion, such as Nature's Gate. Pat some water onto your skin first, then lotion up that area. The lotion will lock in the moisture. 4. For itchy, dry scalp try a rinse of vinegar and water after you shampoo. It will soothe your scalp, help remove some of the chemicals from the shampoo and conditioner and will leave your hair silky smooth. 5. For stubborn, dry, cracked feet rub some petroleum jelly (Vaseline) on your feet at night and wear socks. Do this for several nights to relieve the dryness. If you have any suggestions, feel free to comment and share the info! Merry Christmas in 16 days! Want an easy and chemical free way to clean up in a jiff?---Baking Soda and Vinegar. I had a really stubbornly stained frying pan from making some squash and no scrubbie in the house. So it sat in the sink and soaked. And soaked. And soaked. Still, the stains were there and using a dishrag wasn't working. So... I created a paste with some Baking Soda and water, used my damp dishrag and VOILA! The pan came clean! How about that! I use vinegar for cleaning my shower walls, bathroom floor and toilet bowl. Here are some other uses for Baking Soda and Vinegar. December is Customer Appreciation Month at Subway. For the whole month you can get a 6 inch Cold Cut Combo or Meatball Marinara for only $2, no coupon necessary. Head on over here for all the details.